Centre Darren Cave admits he does not know what the future holds for him with Ulster. The Irish international is one of a few remaining stalwarts at the Kingspan after a mass exodus of big names in recent seasons, among them some of his best friends. “I haven’t made up my mind what I’m going to do yet. I’ve found it tough off the pitch when you lose so many friends. A lot of them were very good friends of mine, so I have found the last while tough but at the same time I have enjoyed working with the younger guys. “It’s a strange one, Chris Henry, Andrew Trimble, Tommy Bowes, they’re guys I’ve known for 13 years. Not far off half my life, so to lose them you lose a lot of your friends from your daily routine. The development of young players at Ulster is a key priority, reflected in head coach Dan McFarland’s willingness to blood those in the Ulster Academy this season. Cave has been in and out of the team and that could have a bearing on deciding if now would be the right time to begin the next chapter in his life. 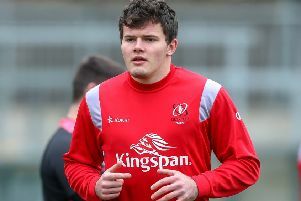 However, Ulster also need experience around to help with the development of the rising talent in Michael Lowry, Robert Baloucoune and James Hume - and Cave fits that bill. “For me, this Six Nations window isn’t about an individual agenda, I’ve been around too long to be worrying about who is starting,” Cave says.